After being introduced into the United States in the early 1980's, alpaca quickly became an alternative agricultural enterprise because of their premium fleece production and their market value as breeding stock. Investing in alpacas has proven to be fun and profitable! Alpacas are classified as a "specialty livestock" and as such have a very attractive tax advantage. We live on a small farm where we were raising a few animals for fun, but without any real tax advantages. My wife told me about an article she read in a magazine about raising alpacas and how they could be profitable and provide a tax advantage for an aspiring investor. We visited several alpaca farms in our area and after a few months we made our first purchase. We purchased two pregnant females and a 6 week old male in December 1999. We were active alpaca farmers able to depreciate our purchases over the next five years. The depreciable property for the farm includes items such as agricultural structures, fencing, farm machinery and equipment, automobiles, and water wells. The next year we purchased two more pregnant females and co-purchased one pregnant female. Today we tend a herd of 40 plus alpacas. The alpacas were insured for the purchase price we paid for them. Clearview Farm and Ranch relied upon the services provided by Wilkins Livestock Insurers. The tax advantage of IRS code section 179 and the 30% additional tax savings after 9/11/2002, plus the income from boarding and the sale of several alpacas, has truly proven to be a great investment with many rewards. Another valuable resource is IRS Publication 225, Farmer's Tax Guide. We recommend that you consult with your tax advisor on how the specific structure of this type of business/investment can be of a benefit to you. PLEASE NOTE: It is important that you contact us PRIOR TO purchasing potential farm property or making enhancements to your existing property! Alpacas are owned by people of very diverse lifestyles. Some are owned by people that have other jobs away from the farm, some are raised by people that are full time farmers and some are owned by people that live in the cities and board their alpacas. 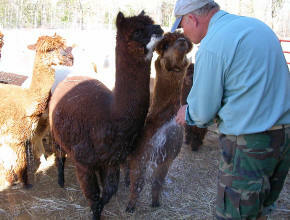 Alpacas are not only a great financial investment but they are gentle, well-tempered, loveable animals. Easily and safely handled by all family members. Light daily chores relative to other species. Clean-up made easy with communal manure pile. Supportive community of those who raise alpacas.